Created with the youngest campers in mind. Kiddie Discovery Camp is an exciting and enriching program. A wonderful opportunity for youngsters age 3- 4, to have their first experience in a creative discovery program. Campers explore the world around them and express their creativity. Your child will also receive the best professional instructors, and most exciting activities that the area has to offer. Experienced and loving counselors on staff. T-division campers will enjoy the best of both worlds! This program is specifically designed for the key transition year between preschool division and junior division. Our staff will help them take that big step by combining core elements from the Kiddie Discovery Camp and the older divisions. They will experience all of the special instructors and fun activities of Kiddie Discovery Camp and age appropriate trips and workshops that are part of the primary camp program, along with experienced counselors who will give them the guidance they need. 1) Click here to register online or call our office at 215 497 9925 ext. 3 with any questions. 2) To secure a spot for your child, a $60 non-refundable registration fee is required per camper. Payment required by June 1st. After June 1st we are unable to provide refunds. We will only be able to give credit for upcoming Gan Izzy summer camps. 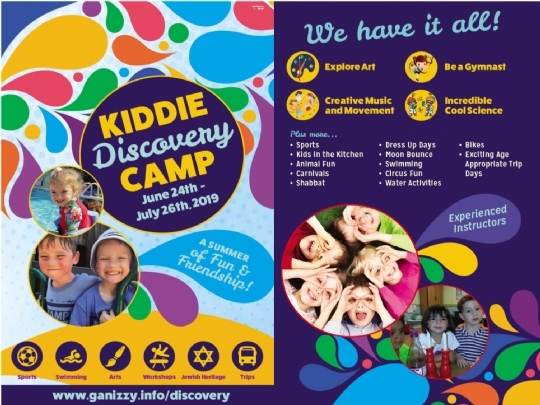 Camp Gan Izzy • 25 N State Street • Newtown, PA 18940 • 215-497-9925 ext:13 - Gan Izzy summer day camp of Bucks County offers a range of exciting activities, field trips, swimming, sports, crafts, and workshops all in a warm and caring environment.